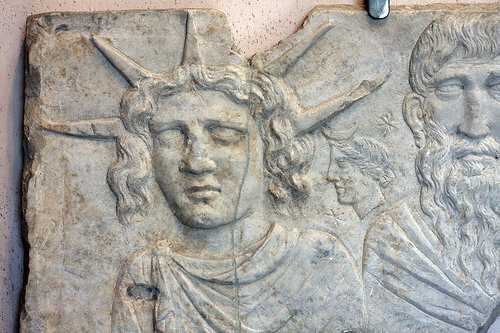 The worship of Attis dated back centuries in Phrygia (aka Anatolia= modern Turkey) before it was imported to Rome in 204 BCE. Roman writers mentioning the religion include: Lucretius (lived 98 - 54 BCE), Catullus (86 -40 BCE), Varro (116 - 28 BCE), and Dionysus Halicarnasensis (first century BCE). Attis predated Christ. Before and during the years the Christian Gospels were written (from the reign of Claudius, 41 – 54 CE) the Festival of Joy, celebrated Attis' death and rebirth was celebrated yearly in Rome. A Christian writer of the fourth century CE, recounted ongoing disputes between pagans and Christians over the remarkable similarities of the death and resurrection of their two gods. The pagans argued that their god was older and therefore original. The Christians admitted Christ came later, but claimed Attis was a work of the devil whose similarity to Christ, and the fact he predated Christ, were intended to confuse and mislead men. This was apparently the stock answer -- the Christian apologist Tertullian makes the same argument. 1) Attis was born of the Virgin Nana on December 25th. 2) He was both the Father and the Divine Son. 4) Attis' worshipers ate a sacramental meal of bread and wine. The wine represented the pagan god's blood; the bread became the body of the savoir. 5) Called "the Good Sheppard," the "Most High God," the "Only Begotten Son" and "Savior." NOTE: Frazer's classic Adonis, Attis and Osiris is a good place to go for details.